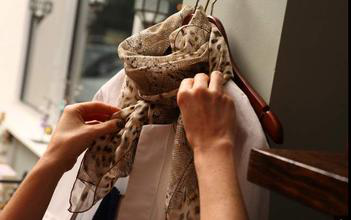 An upmarket chain of US department stores has taken action to stop people buying expensive clothes, wearing them once and then returning them for a refund. About 65 percent of US retailers reported they have been victims of this practice, known as "wardrobing". This form of "return fraud" costs the retail industry an estimated $8.8 billion a year. The store, Bloomingdale's, has started attaching large, black, hard-to-hide tags to the bottom of dresses that cost over $150. The garment cannot be returned if the tag is missing. This means anyone who thinks they can have a "free dress rental" might have to think again. The tag means they would be advertising the fact at their party that they are wardrobing. Retail analyst Hitha Prabhakar explained how serious wardrobing was, saying, "What people don't realize is that it's an illegal process." Wardrobing has become such a problem that Bloomingdale's has decided to risk annoying and potentially losing customers in an effort to deter it. They have, in effect, let go a little of the sales mantra that "the customer is always right". Some Bloomingdale's customers believe the tags make them feel dishonest, while others think it's a long overdue solution to unscrupulous shoppers. The National Retail Federation said, "It's a delicate balance of loss prevention and good customer service, and the relationship has to be handled with appropriate finesse." 1. What is the meaning of the underlined word "wardrobing"? A It means people buy expensive clothes, wear them once and then return them for a refund. B It means people wear wardrobing at night. C It means people wear wardrobing to take part in the party. D It means people wear wardrobing to show. 2. The garment cannot be returned if the tag is ____. 3. The following are what people think of wardrobing EXCEPT _______. 4. What’s the purpose of the store attaching large, black, hard-to-hide tags to the bottom of dresses? A To stop people wardrobing. B To fit the style of the clothes. C To make the clothes more attractive. D To show the tags. 5. From the passage, we know that ______.